Nowadays, local and state government use of information technology has been manifested in several independent systems, each one satisfying one specific program need or supporting one business function. As a result of this, a large and rapidly growing number of individual systems are employed for government-to-government (G2G) business across local and state levels. Furthermore, this multiplicity of systems of often said to be a significant impediment to effective work. Additionally, it is also a strain from the financial perspective since many systems need their own software, hardware, office space, security, as well as business rules (Stenberg & Austin 2007) (Kim & Bretschneider 2006). Therefore, in order to enable smooth performance of business functions on every system, local government personnel and officials are required to sign in and sign out when they use each system, demanding several log ins and passwords. Typically, data which is entered into one system cannot be used by other systems. Enormous number of duplicate requests for information are made and granted as independent individual organizations reply to uncoordinated requirements and requests, thereby posing a significant burden on the functioning and work processes of both local governments and state agencies and implies higher than required costs of every individual (Augustsan 2001). As a solution to this bottleneck, the New York State-Local Internet Gateway Prototype was developed for testing an alternative strategy to this present way of working. The main objective of this Prototype was to determine, demonstrate, and measure the key factors that are associated with a single point of contact to enable G2G work amongst local and state governments. 11. easily available to every local and state user, and highly reliable (Kim & Bretschneider 2006). The features were eventually adopted as core principles for guiding a prototyping effort in order to test the feasibility of a common contact for G2G work between local and state governments (Stenberg & Austin 2007). 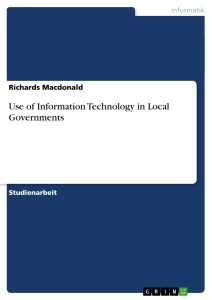 Toward that end, the local governments have been using information technology for a long time; however, the level of capacity of information technology differs tremendously across local governments. While development of web-based E-government applications becomes increasingly prevalent, enforcing newly developed IT continues to rely on the usual ability of government to receive, manage as well as utilize IT (King 1982). Improvising and enhancing the infrastructure for communications and information within local governments has remained a hard shell. Numerous ambitious public-sector projects in Information technology fail mainly due to the inadequacy of resources, impractical expectations, and the shortage of strong support from the upper force. Significantly, these are the findings of Research and Consulting Center of GFO in its regular work on local and state public agencies nationwide. However, the risk still persists to do nothing within the Information Age. Nowadays, consumers are rather accustomed to getting everything from the daily groceries to an MBA degree online. Instead of expressing dissatisfaction, the knowledgeable consumer might be exiting for better alternatives (Augustsan 2001). 1. How and why a public agency is required to undertake the deployment and utilization of a modernized integrated information system?